My dad asked me the question that stopped me in my tracks. I couldn’t be honest. That’s just not how I was brought up. Every compulsion I had to be true to myself stopped with that question. I couldn’t bring myself to tell my religious father that I believe Christianity is what makes us like this. We both grew up in the Christian lifestyle. Going to church every Sunday, perhaps once or twice a week besides that for small groups and youth group gatherings. My grandparents were missionaries in Nigeria. Both of my parents went to Wheaton College. Let’s just say that I was coerced strongly into the Christian world since birth. As Dad and I considered the reasons for our perfectionism, my thoughts raced to Jesus. 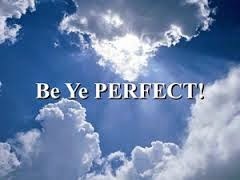 Jesus wanted us to be perfect. How many times had I been told that I wasn’t good enough because I constantly needed to confess to Jesus my shortcomings? How many times had I convinced myself that I could not be anyone without Christ? How many days, months, years, had I been pursuing living the perfect Christian life? To no avail. “Perfect Christians” do not exist. As much as anyone could have told me that in the moment, I would not have believed it. Look at my grandma and grandpa. They must be perfect Christians. They hosted SIM (whatever that stands for) prayer meetings weekly, my grandfather played violin in the church orchestra, my grandmother spent hours not only drinking coffee and journaling in prayer to Christ, but also singing praises. I only saw my grandparents as Christians and it wasn’t until much later that it made sense that they were people too. It wasn’t until my grandmother was very sick. After being diagnosed with a bladder infection, struggling with diabetes, and then falling down stairs multiple times, my grandmother started to become more popular at the nearby emergency room. With each hospital visit, she was encouraged to complete various exercises at home. One night, after spending time eating dinner with them, Grandpa reminded her to get started. She bickered with him and reminded him how much it wasn’t his responsibility to make sure that she did them. She grudgingly pulled herself into the living and complaining the whole time, showed me that she was in fact human, and maybe not the “perfection” of Christianity that I had thought. I thought Christians weren’t supposed to complain. I thought Christians weren’t to argue. I thought Christians were supposed to be nice and kind and consistent with others. I believed that Christians were to follow God’s word no matter what and continue pursuing God’s direction by interpreting the Bible through prayer and discussion among Christian friends. Seeing my grandmother talk like this to my loving grandfather, it opened my eyes to true Christian life and the reality of Christian imperfection. What makes us like this Dad? My reaction is to always give the correct Sunday school answer, Jesus. He’s the reason why we’re so fucked up.